DISCLOSURE: This is a compensated campaign in collaboration with Latina Bloggers Connect and WGBH. However, all opinions expressed are my own. Halloween is creeping upon us and with Halloween come scary movies! Now I am a total chicken when it comes to scary movies, so I usually skip them entirely. Since I had kids, I've been eternally grateful for non-scary Halloween movies. 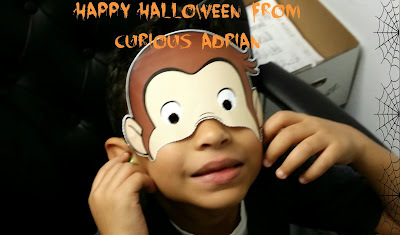 You can imagine my excitement when we received the first ever full-length Curious George Halloween movie, Curious George: A Halloween Boo Fest, to preview. Imagine, ripping open the package and immediately popping it into the TV kind of excitement. Adrian was pretty excited too! We LOVED the movie! It's a twist on the classic headless horseman but it involves a headless scarecrow and some Halloween fun. We have watched it every night. I think your littles would enjoy it too. 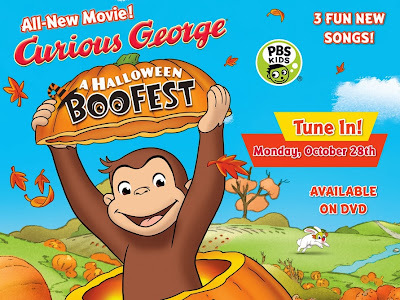 Curious George: A Halloween Boo Fest will debut on PBS KIDS on October 28th and if you can't wait until then, the DVD is available in stores! Curious George: A Halloween Boo Fest All New Full-Length Movie. Head to Renkins' Farm and join Curious George as he searches for No Noggin in this special Halloween themed movie. Hang on to your hats and get ready for a spook-tacular good time, with Curious George. Autumn is here, bringing colorful leaves, hay rides, pumpkin patches and the annual Boo Festival. After hearing about a legendary scarecrow who steals hats, Curious George and his friends set out to find him. By the time he gets to the festival, George realizes that it's not always easy to pick the perfect pumpkin, and that winning the prize for Best Costume may be as difficult as catching No Noggin. Pbskids.org/curiousgeorge. 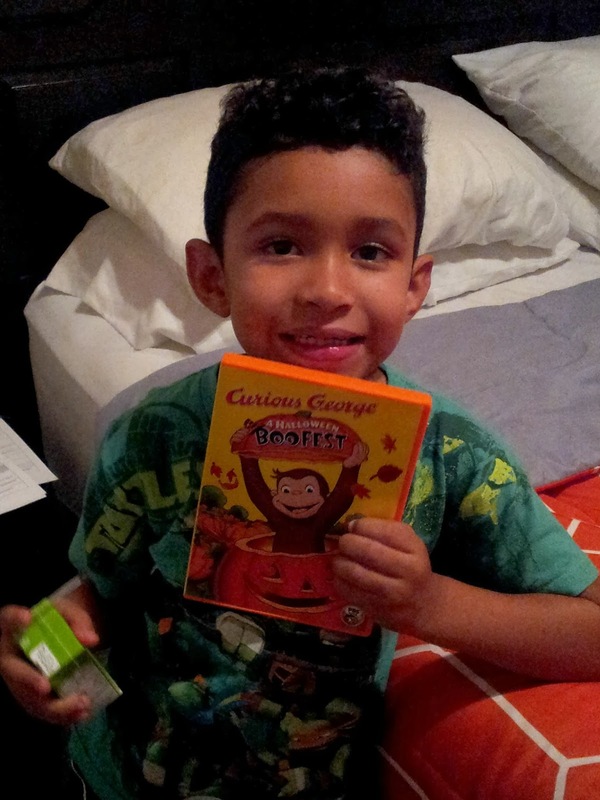 We also received Jorge el curioso va a una fiesta de disfraces/Curious George Goes to a Costume Party (Bilingual) book. We read stories every night before bed and Adrian is now into bilingual books so he really enjoys this one. In celebration of the movie, Pbskids.org has activity sheets for kids. We have had lots of fun with these. So get everyone together for some family-movie fun on Monday October 28th! I'm sure your family will love it as much as mine does!